Love and money are important aspects of the everyday lives of couples. 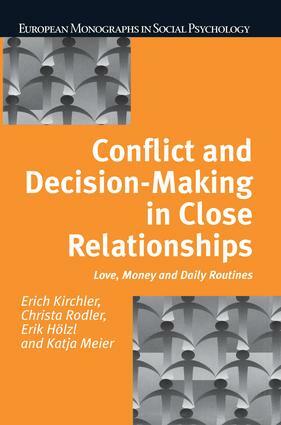 This book focuses on the daily routines of disagreement, conflict and joint decisions on these, and other issues such as work, leisure and children, create in the household. Central to the authors' research is a unique diary study of forty couples, who kept a daily record of their joint decisions over the course of a year. The diaries show how challenging, varied and complex the conflicts and decision making of normal everyday life can be and reveal that goals frequently change during the decision-making process with the result that the final outcome often achieves a goal distinct from the original intention. Furthermore, the dynamics of decision making differ according to the problem at stake, the decision-making history of the couple, and the quality of the partnership. The results of the diary study are discussed within the overall context of current research in the field as a whole, including discussion of joint decision-making case studies, close relationships, decision-making research in general and special research methods. Numerous results of psychological, sociological, economic and consumer behaviour studies are summarised and integrated into a model of household decision-making. This book will be primarily of interest to students and researchers in social psychology and economic psychology, but its interdisciplinary and applied nature will also make it of relevance to professionals working in the fields of family therapy and consumer behaviour.